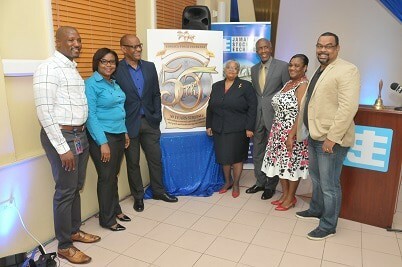 (KINGSTON September 21, 2018): The Jamaica Stock Exchange will be celebrating its 50th Anniversary in 2019 and as a prelude to this celebration the Stock Exchange unveiled its 50th Anniversary logo and tagline to the public at a Bell Ringing Ceremony at its head office at 40 Harbour Street, today. At this event, the JSE took the opportunity to unveil its App for Apple devices. Mr. Garth Kiddoe, Chairman of the Jamaica Central Securities Depository (JCSD), spoke to a recent achievement in the JSE’s history; the accreditation of the e-Campus Post Graduate Diploma by the University Council of Jamaica (UCJ). He stated that this is a great milestone by the JSE and will redound to the benefit of the JSE over the long run. Miss Suzette McNaught, IT Manager took the opportunity to unveil the JSE App for Apple devices. She explained the features of the App to the audience and encouraged users within Jamaica, the Caribbean and the world to download the App and to keep in touch with current activities in our market. She asked the audience to provide feedback to allow for improvement where necessary. The Chairman of the JSE, Mr. Ian McNaughton, in his closing remarks stated “The financial industry, it is thought, is made up of people who produce investment deals, create investment products and make money for companies and the investing public. However, today proves that we are much more than that as we have unleashed a part of our creative side to the public. I would like to use this opportunity to remind us of the achievements of the Exchange. In 2015, we were voted the Number One Stock Exchange in the world, although we are a very small Stock Exchange by international standards. Since then we are still within the top 10 ranking of stock exchanges in the world. As we Jamaicans would say “wi little, but wi tallahwah”. The winners of the logo and tagline competition were, Miss Kaydene Cammock who walked away with the logo prize while Miss Charlene Steer and Miss Charlene Myers were declared joint winners for the tagline.